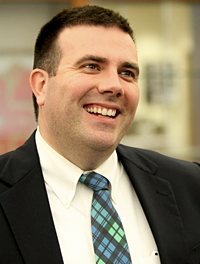 The Office for the Mission of Catholic Education launched in July under the leadership of Jason Slattery, former principal of Ave Maria Academy in Maple Grove. With his wife and three sons, he attends Sts. Peter and Paul in Loretto. Now working on a doctorate degree in leadership and interdisciplinary studies at Creighton University in Omaha, Nebraska, Slattery shared his vision with The Catholic Spirit for how the new office will serve Catholic schools in the Archdiocese of St. Paul and Minneapolis through its focus on forming mission-driven leaders and students in a competitive marketplace. The office was created after the Office of Catholic Schools closed in June. Q. What appealed to you about this position? A. Bishop [Andrew] Cozzens [vicar of education] wrote a position paper that was published last spring really articulating the vision for the office. The position paper essentially outlines a new framework, which is right at the center of where the archdiocese needs to move on the questions facing Catholic education. And it really recognizes a couple of critical features. The first is that, unlike 30 or 40 years ago, we really do have a marketplace now of school choice, and that marketplace — although it can be very good for families to have some choice in education — has become very competitive for our schools. If we don’t live our differences clearly in this marketplace, it becomes hard, firstly, for families to find us, and secondly, to give them a compelling reason to stay with us. We really have to become clear about what makes our schools different in this marketplace and live those differences authentically. Q. How does the office’s role differ from what it used to serve as? A. [Bishop Cozzens] would say in that proposal that we, at least for the last 30 or 40 years, operated as a quasi-school district. But when you think of the structure in what was the Office of Catholic Schools, it never had enough resources to do anything near what a school district does. And because of that, it tended to be focused on more logistical questions and some of the day-to-day questions, as opposed to the thing that the Church can give it, which is a clearer vision of what a Catholic school is. Q. Why was it important to start a new office rather than restructuring the old office? A. That’s something that I unfortunately can’t speak to as well because I wasn’t necessarily a part of those decisions. At least the re-articulation of the name was essential in the sense that it posited what our work was going to be, which was going to be concerned with the mission of every Catholic school. Q. Tell us about your short- and long-term visions for what this office can do. A. We have some tremendous community partners in [the new Catholic Schools Center of Excellence] and the Aim Higher Foundation, and a list of other people who want to help us. I’d say long-term vision is where I’m spending the most time right now. When I look at the longer-term questions, I think that we’re going to need to look at three populations and work with them: One would be school leadership — principals and presidents — to really help them understand that a Catholic school is an essential part of our society and that it can play an important part in the role of the family, and that it’s kind of a wheelhouse for evangelization and catechesis. So, it’s creating structures to form those leaders. Second would be working with our pastors and chaplains to help them to understand their essential work in a Catholic school, the witness they give. The third area would be teachers and faculty, providing formation opportunities in the competencies. We’re very focused in this sense. We hope to branch out to work with Catholic boards in our schools and then really look at the system as a whole. The second set of priorities outside of leadership formation is looking at how our schools are meeting the needs of our Latino brothers and sisters. This is a population that would be well served by Catholic education, but there do appear to be some roadblocks to access, so I’m interested in . . . understanding what those are and helping those children find a good Catholic education supported by their families. Q. What excites you most about what you’re doing? A. This vision of what a Catholic school is, living the five areas clearly — that really does excite me. (See “5 things” box at right.) A Catholic school is an opportunity for a child to encounter Christ in the classroom. And those six or seven hours a day — this is where real transformation takes place. So, the opportunity to work with faculty and with principals especially — who are our frontline in creating those environments for the Lord to work in the life of a child — this is really what drew me out of a school that I loved a great deal. Q. How did your time in the school in different roles prepare you for what you’re doing now? A. Often when I talk with principals, we start on that slate of, I was just like them — whether you’re facing very difficult budgets or trying to reach your enrollments coming in on the first day of school, or dealing with faculty turnover as it occurs. . . . So living that in a hard market on a shoestring budget taught me a lot about what was essential in the education of a child and what wasn’t. Q. As you’re learning more about the archdiocese as a whole, what are some of the challenges some of our schools face? A. First, it’s a challenge for their identity in the marketplace. That is, how do we come to understand that for most of our parochial elementary [schools], the market isn’t just the parish. They’re going to have to press themselves outside of their parish population. But our schools’ resources are already awfully slim, and we ask a lot of our school leadership just in terms of running the day-to-day operations of their schools. The thought that’s required in going out and bringing folks in, that takes a lot. So, how do we help our Catholic parents, wherever their kids are in school, to see our schools as the choice? The Catholic school is excellence. It is, in fact, the best choice for their child. It’s about equipping schools to really understand this kind of missionary focus of going out and inviting folks in. Q. What is the office’s connection to the new Catholic Schools Center of Excellence? A. CSCOE is going to be a critical partner, particularly in helping our schools gain access to marketing and admissions management. They’re going to assist also . . . in understanding how to measure academic excellence. But stemming the enrollment question is going to be the one area, I hope, where they can help us in the very near term. That organization has a lot of potential, a lot of optimism and some good leadership, so it’s going to be a matter of charting a good partnership as we walk along together. Q. What would you want our Catholic parents?—?whether or not they have children in a Catholic school?—?to know about Catholic schools? A. I would want them to know that a Catholic school operates on a premise of human dignity. The way a Catholic school views their child and the great gift that their child is to the family, is through, I hope, the same eyes that they would see themselves — that this is a precious gift that God has given, and this child has dignity as a child of God. And this education, then, is going to be unlike anything else they’re able to find because of the way we start. Apostolic formation — helping students appreciate and integrate a life of service. Slattery said a student could potentially spend 25 years in the Catholic school system if he or she enters at age 3 and attends a Catholic university. “As they move through, that they really recognize in others dignity, and seek to respond to it in service,” he said. Vocational formation — “God calls everyone to holiness. Responding to that, students really come to understand what God might be calling them to do,” Slattery said. Formed this year, the Catholic Schools Center of Excellence is an independent nonprofit focused on helping schools in the Archdiocese of St. Paul and Minneapolis increase grade school enrollment and improve overall excellence. “Our Catholic grade schools produce critical thinkers with mature moral values,” said Gail Dorn, CSCOE president. “Our society needs them.” CSCOE is collaborating with school principals and community partners, including the Aim Higher Foundation. Its website is expected to launch in September. In its third year, the Aim Higher Foundation works to expand access to Catholic schools in the Archdiocese of St. Paul and Minneapolis. As the primary and independent fundraising entity for schools in the archdiocese, it has provided more than $1.8 million over the past three years to 800 students in 75 of the 79 local Catholic elementary schools. “There are a lot of people who love our Catholic schools and are looking for ways to support them,” said Scott Breimhorst, Aim Higher Foundation executive director. For more information, visit AimHigher.org.